Italian researchers are developing a humanoid robot to replace humans in search and rescue operations following disasters. Walk-Man is being taught to move and walk at the Italian Institute of Technology (IIT) in Genoa, and could one day save your life. The robot still needs instructions from humans, but in the near future it should be able to assess dangers and environmental conditions before taking action to get the job done. The Walk-Man team is currently working on the robot’s software to improve its ability to support itself while walking over rough surfaces. IIT senior researcher Nikolaos Tsagarakis explained to euronews that the robot is kind of anthropomorphic: it has joints and motions similar to a human body. Walk-Man is being developed within a European Union research project and is fitted with a stereo vision system and a rotating 3D laser scanner. Researchers plan to have a human operator take control remotely for advanced problem solving. The robot has already driven a car and can make many human-like movements. 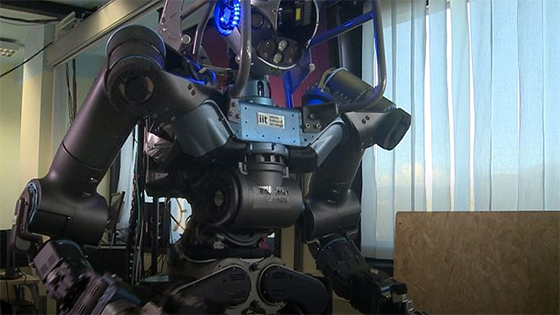 The researchers’ big technical challenge has been how to control locomotion, balance and manipulation of this 1.80 metre tall robot. The robot’s power is similar to a medium-sized car, explained research engineer Ioannis Sarakoglou. “Every joint of the robot, let’s say the knee joint or the hip joint, which needs to provide a lot of effort, are similar to the power of a 50 cc scooter engine,” said Sakoglou. In places that are safe for humans, robots that look and behave like humans could have advantages over robots on wheels. – physical sturdiness – e.g. operating conventional hand tools such as pneumatic drills or cutters. Many of the robot’s actions use gravity rather than energy to move. The next step for Walk-Man will be a major test it is expected to pass under the eyes of the Italian Civil Protection authority. During the test, the robot will be sent into a building on fire. Its mission: to search and rescue a human being.